Iron Forge Cables' 25 Ft Outdoor Extension Cord is the perfect power cable for all your outdoor electrical needs. It offers durable strain relief for optimal performance, and a 3 prong grounded molded male plug for added safety. The cord's 25 foot length gives you great reach across your garden. UL Listed. Whether you want to power a leaf blower, lawn mower, pressure washer, weed whacker, electric drill, bug zapper, power saw, Christmas decorations, or outdoor Christmas lights, this good quality extension cord is designed to meet all your outdoor needs and hold up well. It's both water resistant and flame retardant. The vinyl covering protects the cable against abrasion and direct sunlight. The extension cord has a fantail with 3 power outlets so you can run multiple electrical devices simultaneously. And the cord's green color blends in with your lawn, giving it a nicer cleaner look. 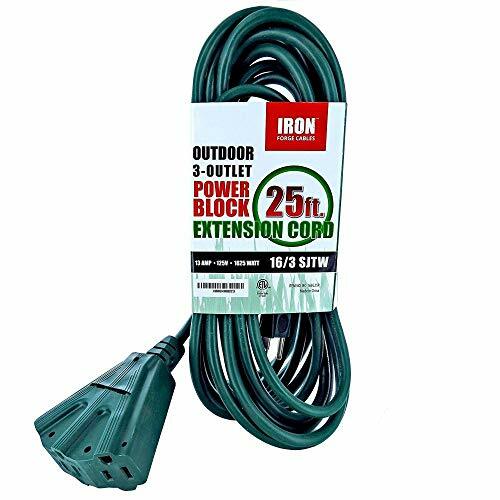 We know you'll love Iron Forge Cables' 25 Ft Outdoor Extension Cord. Click the "Add to Cart" button and order today!